Starting a garden can be overwhelming! There’s the research, the supply-gathering, the decision of whether to wear a floppy sunhat or the classic straw. I’m tired just thinking about it. But if there’s one thing that feels good, it’s avoiding food waste. And saving money. And making things grow. So actually, we have a lot of good feelings happening here. What we’re talking about here is how to use your vegetables to grow more vegetables! Vegetative growth means that there are no seeds involved. You are basically cloning your food. Evil scientist laugh is optional, but definitely encouraged. Choose the larger cloves of garlic from your head (aka, mother clove). This is what you’re going to plant! Eat the smaller segments, or you know, use them to ward off vampires. Since this plant won’t take up much space (the above-ground part will shoot straight up), a small container works perfectly. Grab your empty yogurt, hummus, or butter containers. Poke holes in the bottom of the container for drainage, and use the lid as a water catch for the bottom. Easy! You just made a planter. With plastic water or juice bottles, cut in half and flip the top around to fit snuggly into the bottom half. Now you can put soil in the top, and it will drain into the bottom. Rinse off your celery trunk and place it face up in a bowl of warm water. Over the next week, you’ll notice the stalks go yellow, but the inside will sprout new leaves! I predict you will be very excited when this happens. After about one week, you can transfer this celery-clone into a planter. You can use the same method listed above to make a planter, but use something bigger. Another option would be to use a spare colander, or pick one up at a second hand store. These containers drain really well, but might be better for patio/outdoor planting as the holes will leak some soil. To plant your celery, bury the dying stalks in soil but leave the new leaves exposed. This is exactly the same method as I explained above, but with Bok Choy! This was also explained on 17apart.com. Next time you buy scallions or green onions, place them in a cup/jar/vase of water. Chop off the tops of the plant as you need, and they will regrow! It’s so magical, people will be throwing you in pools of water to see if you float! 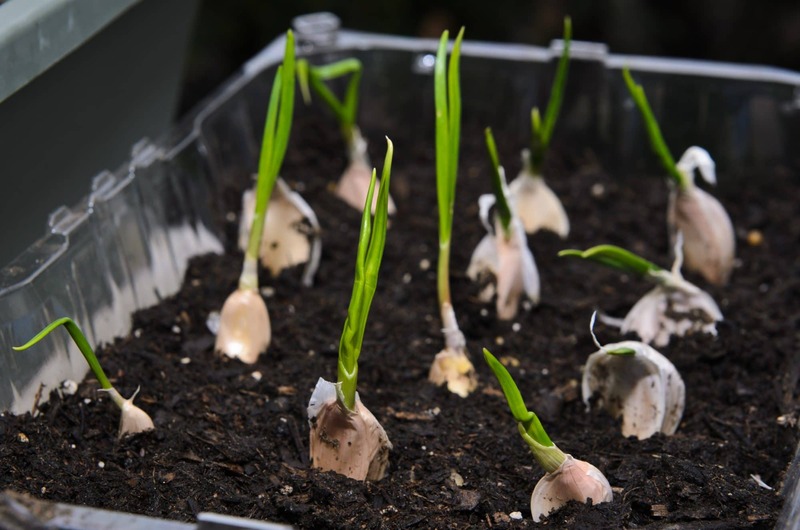 You can eventually transfer the onions to soil for more long-lasting growth. Ever wonder why people have told you to cut the sprouts out of your potatoes? Potatoes belong to the family Solanaceae, which also includes tomatoes and eggplant. These plants are known for containing alkaloids, some of which are poisonous, others of which are desirable. To regrow your potatoes, leave them in a cool, dark spot until they resprout. Each point of resprout is your “seed,” so chop up the potato according to where the sprouts are. It’s fun to grow them in a trash can, because you are going to keep adding soil as the plant grows taller. I read about this in “Grow Great Grub,” by Gayla Trail. Read similar articles on her website: yougrowgirl.com (I repeat myself). You need to drill holes in your trash can for drainage. As if we needed any excuse to wield a hand drill! Drill ten holes on the bottom and add extra on the sides if you live somewhere very wet. Place three cement blocks or bricks at the bottom. This makes for even better soil drainage. Fill the trash can with 6 inches of soil, then spread your spud seeds 5-6 inches apart. Cover with 2-3 inches of soil. Water the soil so that it stays moist and you should see plants emerge after a few days! Add more soil once they have reached 8 inches. Keep repeating this process until the plants are flowering. At this point, you water the plant less and wait for the vines to dry out. The withered vines are your signal to harvest your taters! All in all this takes 65-100 days. What are your regrowing experiences? Do you have any tips or tricks to share? Thanks for such simple, succinct directions. I can’t wait to try this out. I regrow my organic romaine lettuce. I have several growing in water right now. If nothing else, it is a great project for kids! Winter drives me crazy because I can’t grow my entire food supply like in the spring, wsummer, fall. This year I bought sprouting seeds; organic of course, and grew microgreens of broccoli,buckwheat, sunflower, clover, alphalfa ect in a large sunny south facing window. Also have grow lites to fill in because of the short, sometimes not very sunny days. They do GREAT and are extremely nutrient dense. You can grow as big or small of containers as you want. Only need a couple inches deep of soil. Preferably compost. Thank you . Will try all of the hints. I am not a very good gardener but I plan to give it the old college try. 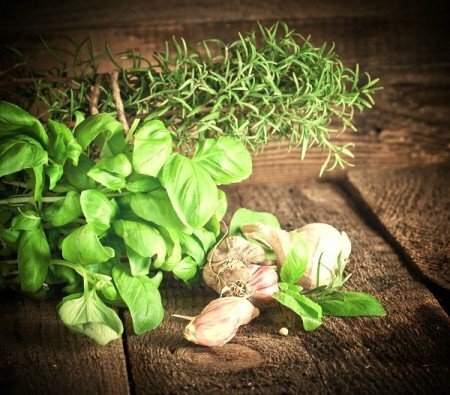 Basil, mint and other herbs can also be regrown from plant clippings. In addition to celery, garlic and scallions, I’m currently re-growing a pineapple top — I discovered it takes 3 years to actually have a new pineapple…I have 2 years left to see if it’s true. I have a garden full of raised beds edged by green onions which are still sprouting, which also keeps the bunnies from munching my greens, and this is how I started all the green onions and shallots. Will be trying it with celery next, since I’ve never had much luck with that from seed! Wow! You are the best, just getting to grow my own Garlic would be great. How about Shallots? Anyone have any suggestions. I love this article. Use the water you save from doing everything you can think of to not pour water down the drain. Water you ran to get warmer water, water you pour off your rinsed sprouts, water that runs through your plants into water catchers. Rinse water that is mostly just pure water.